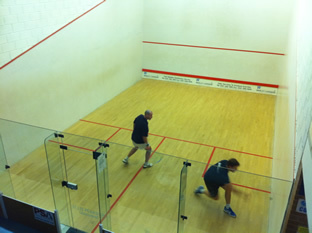 The Wolverhampton UK Racketball Series event proved to be yet another great event, with one of the highest standards yet in the A Grade. Check out all the results, photos and match reports below! Click here to see full results. 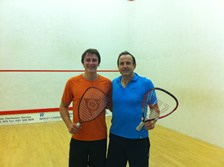 Matt Baker came through the group stages unscathed winning all three of his matches 2-0. The rest of the group was close with Goodings giving Richard Birks a good run for his money before youth overcame experience and R. Birks clinched the match 2-1 taking 2nd place in the group. In 4th place was Jack McElvenny who despite not being a racketball player got progressively better as the event went on but didn’t quite have enough to get the points. This was probably one of the strongest racketball groups I can remember (and I’m not just saying that because I came 3rd) with 3 players who have all held a World Top 200 ranking and experienced racketballer Matt Pugh this was going to be tough for all. Two close 2-0s started the group off with Mark Fuller coming out on top of Matt Pugh and Tom Phipps closing out Andrew Birks. Birks never really got into the match making a slow start and then never recovering with all the momentum going Phipps way. The second rounds were more interesting.Birks began to find length and angles against Pugh, gaining confidence throughout and despite it being close looked a completely different player by the end of the match. Phipps against Fuller was close all the way with Phipps taking the first on tie break only for Fuller to make a good start in the second and run away with the game 11/6. The start of the third was always going to be tough, it was long rally after long rally with neither players going short without a good opening and neither hitting many loose shots. Phipps was favouring the straight attack while Fuller was trying to find openings for the working boast. After about 10 minutes Phipps was leading 7-3 and the match looked to certain to be going one way. At that point Fuller making one last effort to stay in the tournament raised the pace and started to attack, this completely changed the momentum of the match and Fuller raced to a 10-9 lead. The game had now changed from neither looking to be the first to attack to both now seeking to dictate the play in the end Fuller had saved 2 match balls and Phipps 3 before he finally made a forced error at the front handing victory to Fuller 15/13 in the 3rd. The twist in the group hadn’t finished there, with Fuller still having to get at least a game off a much improved A Birks to claim a place in his first final. The match started evenly but quickly it became apparent that Fullers legs went quite moving as well as against Phipps an hour earlier and Birks was hitting the ball well. In the end both games were close with Fuller having 4 game balls to reach the next stages but failing to convert them. The group finished a 3 way tie but with Phipps having the largest number of points coming through as the winner. Birks and Fuller finished level but with Birks the victor when they played he headed through in 2nd place. When you tell people that you only have 4 best of 3 games matches in a day most people look at you as if to say “that will be easy” but just like changing the squash scoring from 15 to 11 the matches aren’t actually less tiring, they might be shorter but the match is so much more intense that the energy you use is probably just as much as a best of 5. Always going to be close, two twins playing on their home courts and both looking a lot surer of their racketball than they did at the start of the day. 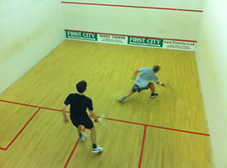 In the end the match was brutal with neither players giving an inch but it was Andrew who eventually sneaked it. Would be interesting to see if the tournament was played all over again on the Sunday whether one of the Birks could have claimed the crown, good first effort with the racketball. Phipps had the harder route to the final being drawn in arguably the tougher of the two qualifying groups and having already had two brutal matches against Birks and Fuller. For Baker this was his third final, having lost to “The series king” Dominic Hamilton in both Nottingham and Esporta, with Hamilton just getting too many balls back and eventually wearing Baker down. Would Phipps have the accuracy and energy to do the same? Baker started the match like a rocket and just like his previous 2 finals raced to a 1 love lead. Phipps was struggling to read the cross court, kill and boast and just looked uncomfortable with the pace that Baker was putting on the ball. The game was over in a flash 11/3 Baker. The second started more promisingly for Phipps, he was moving better and more importantly beginning to read the baker boast. Once he was picking up more balls Baker began to look unsteady with mistakes creeping into his game, Phipps went up 7-2 with Baker then fighting back to 7-7 and Phipps just holding on and taking the game. A large amount of best of 3 racketball looks to be about confidence and momentum and it was beginning to run in Phipps’s favour, it really was game on! 11/6 Baker, that’s what this game will be, was the summary given to me by Rob Watkins as Matt Baker began to creep ahead at the start of the 3rd but that assessment was quickly changed when Phipps managed to hold on and draw level at 4-4. By the end of the game it was nip and tuck and the match was almost all on baker, he was hitting great winners but the next rally he would clatter the tin. By the tie break both players had gritted their teeth, neither looked fresh, but both looked determined not to lose, with great retrieving and desperate attack. The match ended up 16-14 to Baker, a great match and great final. In the end it might have been Bakers determination not to leave with another “runner-up” prize that separated the two. Another fantastic final and probably the closest A grade event so far. The B grade was separated almost 50/50 by tour veterans and virgins. For the veterans fighting it out for top spot on the B grade ranking list included Leckie Dow (ranked 4) and Gary Culverwell (ranked 1) but as always they would have to rise to the challenge against the locals and first timers. There were 3 groups with all competitors fighting it out to win their respective leagues and make it through to the winners group for the next stage. In the end the first timers came out on top with Tommy Murton winning group A, David Herron group B and Stephan Elliott taking group C. The final came down to Murton vs Elliott and was the toughest B final of the series so far. The final went right down to a tie break in the deciding game and then got stuck there with whoever won the rally while level then failing to then have the energy to convert the match ball. In the end Murton managed to just hold on and take the match 15-13 with both players having numerous match balls before the end. The runners-up group was made up of the series veterans Gary Culverwell, James Murphy and Leckie Dow who are all ranked inside the top 10 in the series rankings. In the end the group came down to a tense match between Leckie and Murphy with Leckie taking big leads in both games before running out of steam. Both guys were playing two events again but on the day Murphy just had that little bit more. Check the rankings pages for where this leaves them overall in the series. 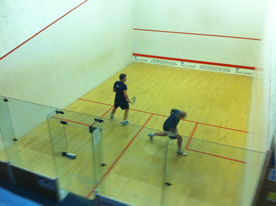 The bottom group also saw some cracking matches between Alex Szygowksi, Joe Faulkner and Will Bennett (UK-Racketball). All 3 not really racketball players but here to give it a go and in the end it was a close battle with Bennett coming out on top, great advert for B grade. The most competitive over 40’s draw of the series so far with Rob Watkins (3 times UK-Racketball champion), Pete Goodings (Over 40’s Nationals semis), Rob Shay (Top racketball coach) and Paul Haigh all present. The 40’s draw also had the largest number of competitors, before the day we thought it would be a great event and it didn’t disappoint. The 4 group winners were the 3 mentioned above and Leckie Dow and it was now a straight shoot out for the title. In the end Rob Watkins came through victorious again but it could easily have gone another way. 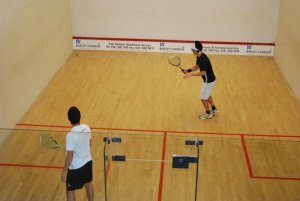 Both Haigh and Goodings took early leads against Watkins and it looked likely that he was heading for his first defeat on the UK-Racketball tour but he managed to eventually battle through. Rob wasn’t his best today and was fortunate that Gooding especially seemed to lack the belief that he could beat him. At 1-0 and 8/6 it looked certain Watkins was heading for defeat but his determination and strength eventually saw him through much to his opponent’s frustration. After his battle with Goodings he asked me “was that the worst game you have ever seen?” And to be honest it probably was not far off. Great effort again from Leckie who has played 2 categories in all 4 of the series events so far and was looking more than a little bit tired by the end of the day. Mike Philips tops another group on the UK-Racketball tour but it was a close battle for second place between Graham Greensall and James Murphy. One tournament to go for Mike to complete the set but Hunts County might be his toughest test yet with the club having some strong age group racketball. Despite going to a club that has almost no racketball at all the tournament was another success and hopefully it will help to give the sport a kick start in yet another area and keep that racketball revolution moving. 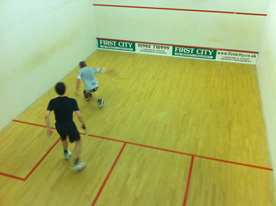 Like Nottingham where 6 months ago there was virtually no racketball at the club and there are now both sessions and leagues, maybe soon the same will be the case with Wolverhampton. We certainly hope so! The Clubhouse has a bar with a comfortable lounge attached. 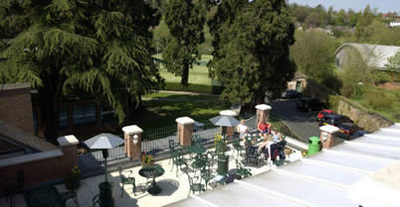 A conservatory and terrace overlooks the grounds and some of the tennis courts. 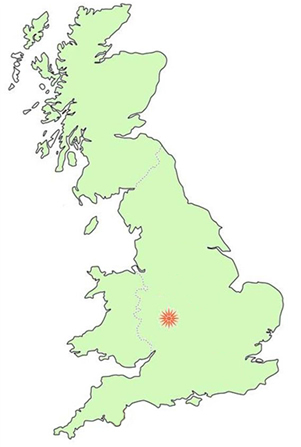 The club was chosen to host the qualifying matches for the British Grand Prix in 2010. 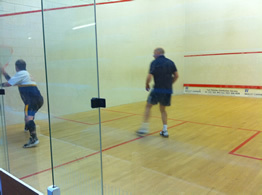 The club has 7 recently refurbished squash courts, two of which are glass backed with seating and viewing facilities.